Three soldiers were wounded Friday when a rocket hit the Eshkol region. Terrorists fire 507 rockets in three days. Three soldiers were wounded Friday afternoon when Gaza terrorists hit the Eshkol region with a short-range rocket. One of the soldiers is in moderate condition, and the other two are in light condition. 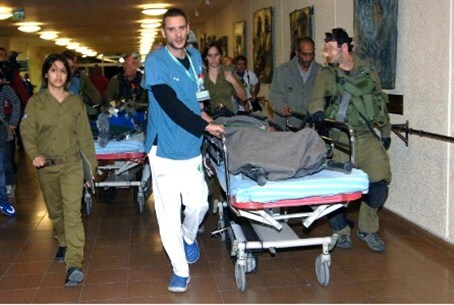 They were taken to Soroka hospital in Be’er Sheva for treatment. Since the beginning of Operation Pillar of Defense on Tuesday, Gaza terrorists have fired 507 rockets at Israeli communities. Twenty-six of the rockets hit populated areas, including at least three that directly hit homes. One hit an apartment in Kiryat Malachi, killing three people. The funeral for one of the victims on Friday was interrupted by yet another rocket attack. The Iron Dome defense system, which was designed to take out the mid-range rockets fired at larger cities, has shot down 110 rockets. At least two rockets have hit the Tel Aviv region, showing that Hamas has increased its capabilities since Israel’s last major counter-terror operation in the area. Both rockets hit open areas and did not cause injury.